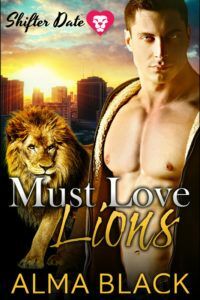 Shifter Date: Must Love Lions is available exclusively on Amazon. Released Nov 30, 2016. Blurb: Alexis Parrish is very single. Sassy and smart, she's great at her job as a journalist, but it's never given her the time to find the right man–specifically, a human. So when she gets assigned to interview Max, a lion shifter, about the new dating app he's created, she can't believe her intense attraction to him. After all, humans and shifters don't date. Luke knows how to get what he wants. A lone wolf at heart, he has no problem filling his bed with willing partners. Sure, it's steamy, but love? It's not in the cards. But when he matches with his best friend's little sister on the paranormal dating app, Shifter Date, everything changes. Jasmine is a fiery lioness and totally off limits–but that makes her all the more alluring. When Luke swipes right on her Shifter Date profile, Jasmine is shocked. Could this be the start of something more, a shifter romance? But Power Shift is out for blood. They oppose any interspecies dating, and will stop at nothing to keep the shapeshifter lines pure. When they attack, can Jasmine and Luke protect each other? Can their newfound love survive? Can wolves and lions be fated mates?